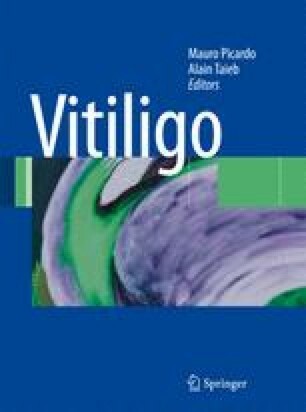 Although the exact aetiology of vitiligo remains unclear, vitiligo is widely considered to have an autoimmune component in its pathogenesis based on disease associations. According to ethnic background, large variations exist in association with autoinflamma-tory/autoimmune disorders. Some reported associations may reflect a simple coexistence of two disorders, and the repertoire of associations may help to detect shared heritable predispositions for inflamma-tion and autoimmunity. Thyroid disorders are the most commonly associated to vitiligo in Caucasian populations, alopecia areata in Chinese populations, rheumatoid arthritis (RA) being more rarely associated in both. I.M. is supported by grant G.0161.07 of the Research Foundation Flanders.